Whether college students are on campus studying or traveling and on outings, there will be many times when you will be exposed to the sun, and it is important to keep your skin moisturized as well as protected from the sun’s rays. One college necessity that we advise our TALK English Schools students should have with them at all times is a good SPF moisturizer. Here is some information about SPF creams, and why you need them. SPF Moisturizer is a specially designed moisturizer cream which contains a specially formulated chemical or natural sunscreen protector. 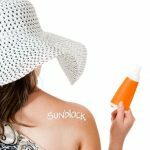 Generally they feature a certain ratio of sunscreen protector ingredients to plain moisturizer, and these sunscreens are very helpful to prevent sunburn and worse when you are outdoors in the sun. Easy to Apply – Because it is in a cream-like based form, SPF moisturizers are generally easy to apply on the skin. They can be quickly applied by rubbing into the skin and take not time at all. Promotes Sun Protection – Because this moisturizer features sunscreen or sunblock it can easily help to protect against any damage that the sun’s rays may cause. It is well known that when skin is exposed to the sun it can cause problems not the least of which is skin cancer in later years, so proper protection is important at all times. Moisturizes Skin – Due to its moisturizing properties, this moisturizer can easily help to reduce the risk of dry skin from sun exposure. Dry skin can crack, become sore, or just feel uncomfortable, and so by applying this moisturizer to the skin you can easily give yourself smooth skin at all times. Compact Size – Versatile in use, TALK English Schools students can easily find a great range of SPF moisturizer products in compact sizes to choose from. Because of their compact size, they are easy to carry around and you can pop them in your hand bag, gym bag, school bag, backpack or beach bag.